A little-known device called a "bump stock" was attached to a semi-automatic rifle. 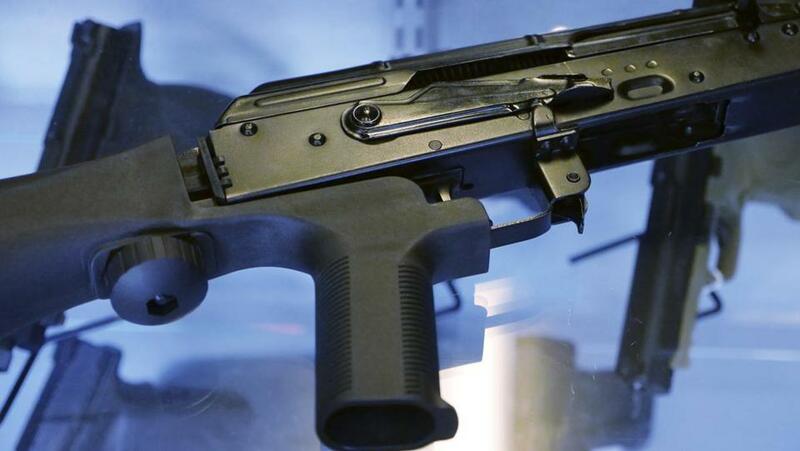 Lieutenant Governor Karyn Polito signed a bill Friday that makes Massachusetts the first state in the nation to ban bump stocks. The move means that it is now illegal to buy, sell, or offer to sell bump stocks effective immediately, according to the governor’s office. It will become unlawful to possess them in 90 days. Bump stocks are devices that can be attached to a semiautomatic firearm to increase its firing speed. With Governor Charlie Baker out of the state, Polito was acting governor on Friday. She signed a supplemental budget deal, which included the bump stock legislation and $129.3 million in additional state spending. The move comes a little more than a month after a gunman opened fire on a crowd in Las Vegas, killing 59, including Rhonda LeRocque, 42, of Tewksbury, and injuring hundreds more. Authorities found 12 bump stocks and 23 weapons in the gunman’s hotel room. “Governor Baker and Lieutenant Governor Polito support the Second Amendment to the Constitution and Massachusetts’ strict gun laws, including the ban on assault weapons and bump stocks, and are pleased that the commonwealth continues to lead in passing common sense reforms,” said Baker administration spokesman Brendan Moss in a statement. Information from the State House News Service was used in this report. Danny McDonald can be reached at daniel.mcdonald@globe.com. Follow him on Twitter @Danny__McDonald.